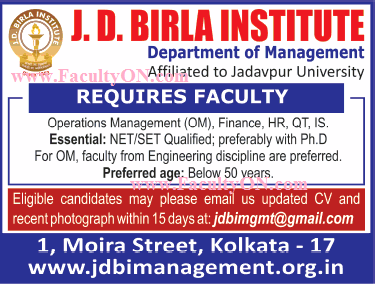 J.D.Birla Institute, Kolkata has advertised in THE TIMES OF INDIA newspaper for recruitment of Professor / Associate Professor / Assistant Professor jobs vacancies. Interested and eligible job aspirants are requested to apply within 15 days from 11th April 2018. Check out further more details below. About College: Kolkata is a private unaided a college affiliated to Jadavpur University, Kolkata. The late Sushila Devi Birla, wife of eminent industrialist late L. N. Birla established a college for girls in her mother-in-law’s name in June 1962. NET / SET Qualified, preferably with Ph.D . For OM, faculty from engineering colleges will be preferred.